Two SpaceX missions have received preliminary planning dates for their upcoming launches out of Cape Canaveral. The Falcon 9 launch with the SES-9 satellite is now aiming for a February 24 liftoff from SLC-40, while the Dragon spacecraft is set to return to action NET (No Earlier Than) April 1 for her CRS-8 mission to the International Space Station (ISS), pending the outcome of a testing issue with the Falcon 9 at the McGregor test site. SpaceX now has two successful missions under its belt since the loss of the CRS-7 mission in June of last year, opening with the Return To Flight success of the ORBCOMM-2 (OG2) launch in December. 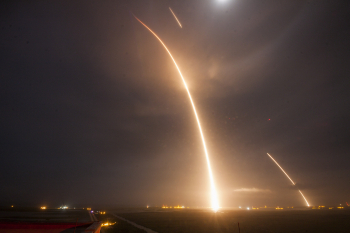 The historic night, which included the debut of the upgraded Falcon 9 and the successful return of the first stage to its Cape landing site, validated numerous improvements to the rocket. The success was followed up with the final launch of the Falcon 9 in her v1.1 configuration, successfully deploying the Jason-3 satellite from Vandenberg. SES-9 is the next passenger waiting for a ride on the upgraded Falcon 9. This spacecraft was set to be the Return To Flight mission for the Falcon 9, prior to SpaceX opting to launch OG-2 mission first. The rationale behind the decision made sense, with the SES-9 mission a more complex GTO flight that requires two burns from the second stage, while the OG2 mission was to LEO, requiring just the one push from the second stage. The manifest option was classed as a “risk buy down” decision for the debut of the newly upgraded Falcon 9 rocket. The SES-9 spacecraft was built by Boeing Satellite Systems and is designed to operate for 15 years in geosynchronous orbit with a 12.7-kilowatt payload and 57 high-power Ku-band transponders (equivalent to 81 × 36 MHz transponders). 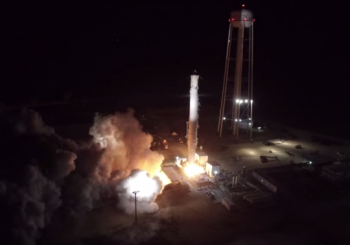 The launch has been delayed numerous times for various reasons, with the most recent slip including a requirement to mitigate what industry sources noted was deemed to be a “generic issue” with the Second Stage. The specifics of the issue was provided to several customers, but tagged as proprietary information. That issue now appears to have been cleared, with SES announcing on Monday that a placeholder for the launch has now been set for February 24. The rocket has completed testing at SpaceX’s McGregor test facility and is currently awaiting a flow schedule towards its Static Fire test. The aforementioned Second Stage will be tasked with a busy role during this mission, lofting the 5,300kg SES-9 spacecraft to its Geostationary Transfer Orbit. SES-9 will also have a busy early life in space, utilizing a chemical bi-propellant apogee motor to quickly achieve a 24-hour synchronous orbit, followed by the use of electric propulsion to circularize the final orbit and to remove eccentricity at 36,000 kilometers over the equator. Subsequent on-orbit maneuvers will be executed with its electric propulsion capability. 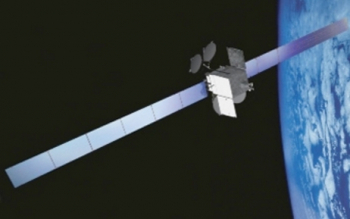 SES-9 will be positioned at 108.2 degrees East, co-located with the SES-7 spacecraft that was launched in 2009 via a Proton-M rocket. Dragon’s long awaited return to Commercial Resupply Services (CRS) operations is currently targeting an April 1 launch date. However, the challenges surrounding Visiting Vehicle schedules and requirements may result in that launch date placeholder being refined over the coming weeks. No official update to the launch date has been posted by NASA, although one of the payload providers did note they received notification from NASA of the April 1 target for their planning purposes. The planning date also allows for the next Cygnus spacecraft to launch first, with the OA-6 mission now scheduled to launch on an Atlas V rocket on March 20, following a slip relating to what sources described as a concern surrounding “cleanliness” of the payload. UPDATE: In preparation for the CRS-8 mission, the Falcon 9 rocket was undergoing her usual series of tests at the McGregor test site. On Friday, a successful hot fire test was conducted. A repair plan is currently being evaluated. 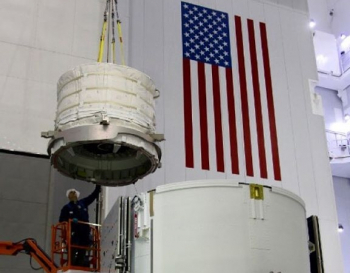 The Dragon passenger will be lofting her usual complement of supplies to the orbital outpost, while her trunk will be hosting the Bigelow Expandable Activity Module (BEAM). The hardware was recently installed into the CRS-8 Dragon Trunk section. 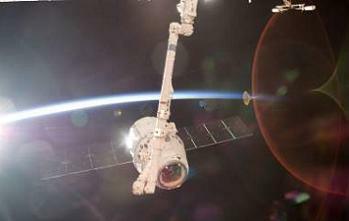 The launch of Bigelow’s BEAM will allow the company and NASA to demonstrate the inflatable habitat on ISS. It is expected to perform at least two years of testing on the Station, providing a key shake out of the technology that is likely to play a major role in human deep space exploration. The arrival of the CRS-8 Dragon at the ISS will mark a return of the spacecraft’s considerable capabilities since the CRS-6 Dragon concluded her successful mission in May of last year. 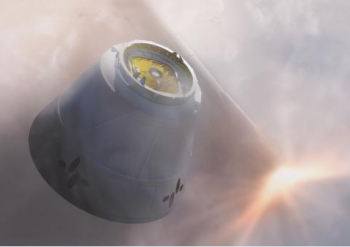 The CRS-8 Dragon will also boast one additional capability, the ability to save herself in the highly unlikely event her Falcon 9 rocket fails. 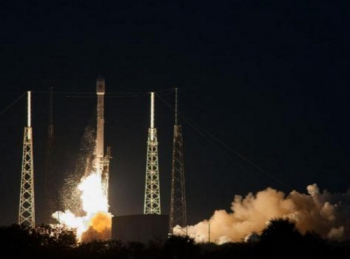 The CRS-7 Dragon was thrown free of the failing Falcon 9. However, she was unable to deploy her chutes that may have resulted in a safe splashdown in the Atlantic Ocean. “That is probably the saddest thing about this, is that, with just a bit of different software, Dragon would have made it,” noted SpaceX CEO Elon Musk last year. The additional few lines of coding relate to Dragon being able to open and release her nose cone – which remains in place during first stage ascent – in the event of a contingency, in turn allowing for the deployment of her parachutes. “For future missions, we’re now including contingency software that, if something were to go wrong with the vehicle, Dragon will always attempt to save itself,” added Mr. Musk. Meanwhile, SpaceX President Gwynne Shotwell recently noted that the Falcon 9 launch rate will start to ramp up to around “every couple of weeks” after the SES-9 launch. However, at present the next two missions – based on the preliminary schedule – are looking at a spacing of around five weeks. The mission that is set to follow CRS-8 is expected to be the Eutelsat 117W B and ABS 2A mission. This is currently expected to launch in April. Spaceflight industries also have an upcoming Falcon 9 booked to launch a host of satellites on its SHERPA platform, although no specific launch date has yet been provided.